Nga Puhi Northland Maori (Red) Baseball Jersey Our 100% cotton Baseball Jersey is a sporty hit with both men and women whether you are in the game or just looking the part in great run-around casual-wear. Choose red, blue or black sleeves. Nga Puhi Northland Maori (Blue) Baseball Jersey Our 100% cotton Baseball Jersey is a sporty hit with both men and women whether you are in the game or just looking the part in great run-around casual-wear. Choose red, blue or black sleeves. Nga Puhi Baseball Jersey Our 100% cotton Baseball Jersey is a sporty hit with both men and women whether you are in the game or just looking the part in great run-around casual-wear. Choose red, blue or black sleeves. Nga Puhi Northland Maori (Brown) Baseball Jersey Our 100% cotton Baseball Jersey is a sporty hit with both men and women whether you are in the game or just looking the part in great run-around casual-wear. Choose red, blue or black sleeves. 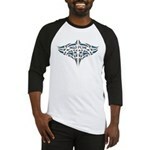 Nga Puhi Moko Baseball Jersey Our 100% cotton Baseball Jersey is a sporty hit with both men and women whether you are in the game or just looking the part in great run-around casual-wear. Choose red, blue or black sleeves.